In an about-face, officials from the US Environmental Protection Agency (EPA) returned to Dimock, PA for another look at water wells contaminated three years ago by Cabot Oil and Gas activities. They are reopening their review of town water supplies after recent tests revealed issues that they say “merit further investigation”. But now, they say, critical data gaps have emerged in water sampling and test results. They are also concerned that residents have alternative sources of fresh water. You can read more about this in prize-winning journalist Laura Legere's article here. However, read press accounts and it’s pretty clear that the meeting was anything but. Several people disrupted the meeting with mic checks and questions about just who the water belongs to. In the noise and confusion SRBC chair Kelly Heffner tried to maintain control, but failed. According to one reporter the meeting was “… interrupted by protesters, and SRBC commissioners completed their voting in private." Another reported that Heffner threatened to clear the room and the commission hastily adopted the recommendations and adjourned the meeting early. Some people who attended that meeting contend that the SRBC chair adjourned the meeting when the disruptions occurred. Commissioners filed out of the room, then returned a few minutes later to vote on the items. SRBC 12/15/11 Wilkes Barre -- Meeting Adjourned Before the Vote from Shaleshock Media on Vimeo. But, says SRBC spokesperson Susan Obleski, the meeting was not officially adjourned at that time. In a telephone conversation earlier today, Obleski admitted that, yes, Heffner did indeed say “adjourn”. However, that call was out of order. “When the commissioners stepped out of the room, they were advised by SRBC counsel that the meeting was still in session,” Obleski said. “The meeting was never officially adjourned.” So when the commissioners returned, they didn’t need to reconvene, as they were still in session. They just had to bring up the docket for a vote. “Which,” Obleski said, “they did according to Commission procedures” prior to officially adjourning the meeting. While there are some questions about how the meeting was conducted, Obleski is firm that as far as approving the dockets goes, SRBC is on solid legal ground. They conducted that portion correctly, she said. As for Heffner’s call to adjourn – that was in response to people crowding up against the commissioners. Obleski noted that the SRBC is reviewing video and audio recordings and should have a public statement soon. “But the dockets stand approved,” she emphasized. Thomas Au, Conservation Chair for Sierra Club PA agrees and called for the SRBC to reconvene to consider the docket they so hastily dealt with on the 15th. “Commission decisions need to be made in an open, public forum,” he said. Last night, by a vote of 6 to 1 the Binghamton (NY) City council approved a two-year moratorium on hydraulic fracturing within city limits. According to the press, more than 100 people crowded into the council chambers to witness this three-hour meeting. Sixty-eight people commented on the proposed ban. Meanwhile, the Tompkins County legislature has approved a resolution urging NY to ban high-volume hydrofracking statewide. That resolution passed in a 14 to 1 vote. In an email to the local press yesterday, Department of Environmental Conservation (DEC) spokeswoman Emily DeSantis remarked on the agency’s need for additional funds for regulating hydraulic fracturing and gas drilling. Apparently those funds “will not be included in the executive budget” – the budget Gov. Andrew Cuomo will propose around mid-January. That’s about the same time that DEC should be getting down to the business of reading through the thousands of public comments regarding the draft Supplemental Generic Environmental Impact Statement (SGEIS). And the proposed regulations for high-volume horizontal hydraulic fracturing. Wayne Bayer, a DEC engineer who is shop steward for the Public Employees Federation union, said the agency is understaffed and its employees are concerned about adding a new regulatory program like hydrofracking. At this point the DEC estimates it will need 140 new workers for the first year permits are issued and 226 by the fifth. Add salaries to the cost of needed equipment and you’re looking at an additional $20 million a year. Where will that money come from? Right now DEC has convened a panel of outside experts to develop a list of fees and taxes that could be levied on drillers to cover the costs. That panel should be issuing a report “sometime in the first part of next year,” says DeSantis. But it’s going to be tough to sell the need for additional staff when Cuomo has already required all state agencies to cut 10 percent from their budgets for the current fiscal year, and is looking for an additional 2.5 percent cut for 2012-13. One of the things that residents in NY have been asking their towns to do before Marcellus drilling takes off is develop some noise and light ordinances. In fact, Tioga Investigates Natural Gas (TING), an advisory group in Tioga County, NY includes information on developing such ordinances in their resource binder (along with road agreements and lots of other useful stuff). 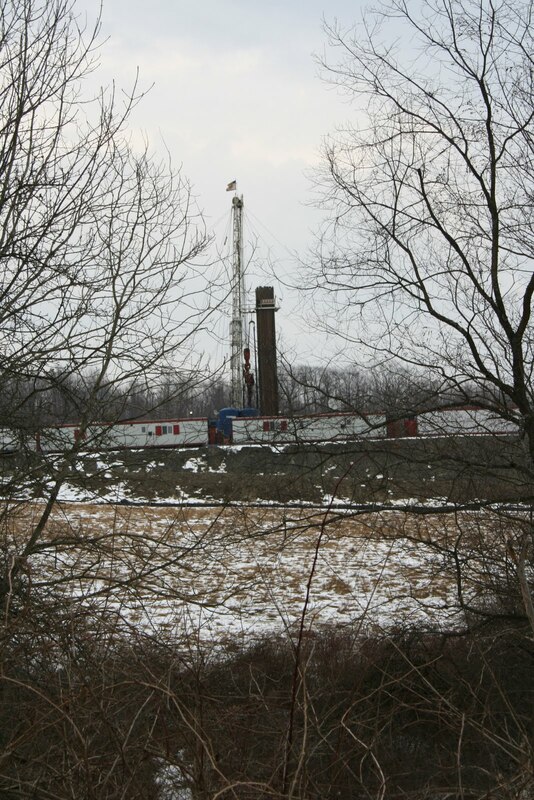 If you have never seen - or heard or smelled - fracking, here's a video of a fracking operation by Williams Gas Company at the Hollenbeck well site on Franklin Forks Rd., Franklin Forks, PA in Susquehanna County. The video was recorded on December 15 - just yesterday - at 6:30 pm. The active drilling site is across the road from a home; pay attention to the truck traffic. Much thanks to Vera Scroggins, Citizens for Clean Water (Susquehanna County, PA)for the video. Paul Hetzler, an environmental engineering technician with NYS Department of Environmental Conservation (DEC) Region 5 says hydraulic fracturing – as it’s practiced today – will contaminate our aquifers. Not might. Will. And that failure, when it happens, will be expensive. Everyone, regardless of whether they are receiving royalties or living miles away, will end up paying for the subsurface investigations, whole-house filtration systems and unending lab analyses as industry lawyers tie up complaints in courts. “I’d love to see hundreds more jobs created,” Hetzler writes. “But not if it means hundreds of thousands using well water will be at a high risk of contamination.” The solution? Develop safe technologies before drilling. Hetzler isn’t the only DEC staffer to speak out against the agency’s current – and proposed – fracking regulations. At the November 30 DEC hearing in New York City Stephanie Low read a statement from DEC employee Wayne Bayer. Bayer is an Environmental Program Specialist and Executive Board member of the DE’'s union, the Public Employees Federation (PEF). He speaks for the 1774 members of the professional, technical and scientific staff of the DEC – those on the ground, he says, who know the issues of fracking and the draft SGEIS best. “The 25 percent reduction in existing staff at DEC has crippled our ability to carry out all existing regulatory and statutory responsibilities assigned to our agency,” Bayer states. 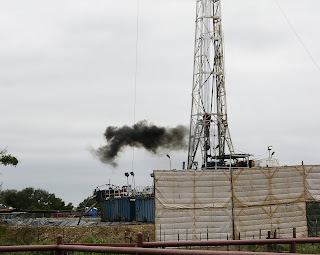 “There is no fracking way we can presently, honestly and adequately add any new responsibility as labor-intensive as regulating, monitoring and inspection activities related to high volume hydraulic fracturing of natural gas.” Until DEC can hire adequate staff … “the moratorium should be extended.” You can hear the entire statement here. Last Friday Pennsylvania Environmental Hearing Board Judge Bernard Labuskes Jr. told the Carter Road residents that they would not see future water deliveries. At least not until they have allowed Cabot Oil & Gas to install “whole-house gas mitigation” systems for their wells. When the water shipments were canceled twelve days ago, the 11 families depending on delivered water appealed to the PA Environmental Hearing Board. They argue that the state is wrong in ignoring the harm that could come from drinking contaminated water. It’s more than methane, say the Carter road residents. Their water contains metals and volatile organic compounds including solvents and manufactured chemicals at levels higher than state and federal standards. 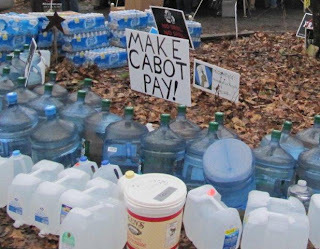 Of course, Cabot and the PA Department of Environmental Protection (DEP) submitted their own arguments, noting that the Environmental Hearing board doesn’t have the authority to force the driller to continue deliveries of drinking water. Nor does it have the authority to order DEP to take enforcement action. So where does that leave the Carter road folks? With empty water tanks. Because, as some of them have told the press, the treatment system Cabot is offering only targets methane, not the other toxic contaminants. And what they want – despite the political bickering and nasty comments from the “Enough Already” crown – is their water back. They want good, clean water to drink – or make soup. Not a wad of cash. Can DEC adequately monitor NYS drilling?